FAANG means Facebook, Amazon, Apple, Netflix, Google. Given how quickly major Silicon Valley companies have grown, they’re now having an outsize effect on the health of the American stock market. If Silicon Valley is having a bad run, the S&P 500 could have a bad day. Indexes like the S&P 500 have become even more important as big investment groups have made large bets on these indexes, (in) which “passive investment” investors bet on an index. 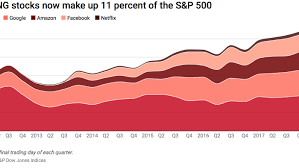 Facebook, Apple, Amazon, Netflix and Google — referred to collectively as FAANG — now make up more than 11 percent of the S&P 500 index. That’s nearly double what they represented in 2013, when Facebook first became part of the index, which only lists the most valuable public companies in the U.S. These five companies had a total market value of nearly $3 trillion as of the end of the first quarter of the year, which means their influence on the index has greatly increased. It stands to reason more valuable companies would carry more weight on an index of the most valuable companies, but given how quickly major Silicon Valley companies have grown, they’re now having an outsize effect on the health of the American stock market. In other words, if Silicon Valley is having a bad run, the S&P 500 could have a bad day as well. Indexes like the S&P 500 have become even more important as big investment groups — pension funds, mutual funds and 401Ks — have made large bets on these indexes, which are seen as a modestly safe though aggressive investment. So-called “passive investment,” where investors effectively bet on an index and sit back, have also become popular, adding to the importance of the S&P 500.